Hello! I started playing Hearthstone a year ago and have recently gotten back into the game. I got a bunch of free packs for being away so long, so I built a weenie deck. Other than adding the legendary Sunkeeper Tarim once I have enough essence; I can't think of any changes to make my deck better. So far in ranked I have only had trouble with hunters. Should I change anything about my deck? 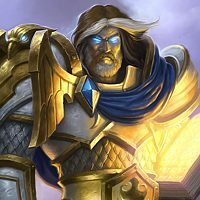 I think your deck is great, but here are some suggestions anyway because I've been playing a lot of 'dude paladin' lately.